If you require Royal Mail 'Signed for' (optional for UK), please add ONE ' Signed UK' from the 'select size' drop down box. 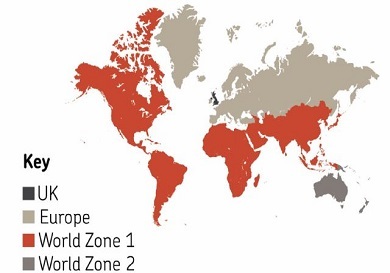 If you are ordering from overseas, you MUST add ONE 'Zone' from the selection of Europe, World ZONE 1 or World ZONE 2 depending on your location (see map).We will only send your order by Royal Mail 'Tracked & Signed' to overseas destinations. These costs are over and above our standard delivery cost.